Since bubba got on the move, she seems able to sleep in any position. Mostly on her knees with her bum in the air! When I put her down for a nap during the day I can often hear her chatting to her toys and moving around but it's only when I check on her I find she has crashed in an uncomfortable (for me anyway) position. 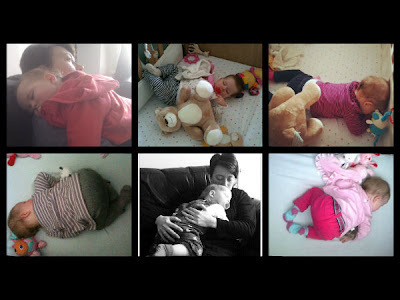 So in true embarrassing mum mode, I've put together a little montage of her strange sleep positions. I'm worried for when we put her in a big girl bed and go in to find her asleep on the floor crumpled up against the radiator or something!